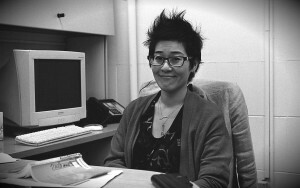 Elda Tsou is associate professor of English. She offers courses on literary theory, ethnic American literatures, and Asian American literature and culture. Her book, Unquiet Tropes: Form, Race and Asian American Literature (Temple 2015), argues for reconceptualizing Asian American literature as a particular and historically specific set of classical rhetorical tropes. Her work has been published in PMLA and JAAS. Her next project, Forms of Whiteness, is an interdisciplinary intervention into the mode and style of whiteness.